My family got a late start to spring cleaning this year. It was practically summer before we took the time to re-organize our home. Our office area was no exception. There we keep all of our important documents, reference materials, and worksheets for our daughter and more. One of our main priorities was to reduce our clutter and find ways to lessen our impact on the environment. We were introduced to Sustainable Earth™ by Staples, their new line of eco-friendly products. Thanks to Staples, we were provided with each of the above (except the clipfolio) to try in our home. The calculator and stapler were very impressive and unexpected. The high quality of the products and function would not have led me to believe that they were once used ink cartridges. 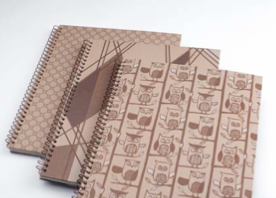 The notebooks were sturdy, with quality pages and great designs.The clipboard was very colorful and sturdy. Loved the pattern and again, hard to believe it was made from recycled material. The file folders and hanging file folders got the job done. They were a little thinner card stock than I was used to but no difference in the performance. The copy paper was excellent - great for printing (and doodling/coloring as my daughter discovered.) Just as with the others, I really couldn’t tell that the envelopes were recycled either. Overall my family was very impressed with Sustainable Earth™ by Staples. Our office area looks great! !With pricing for the line starting at under $3, it is a great way to reduce the clutter, get organized and lessen your impact on the environment. Disclosure: I was sent these products without charge for the purpose of review. All opinions are mine own. I care about the character of my blog and only recommend items that I use, or would use, myself.